Property Location With a stay at Crossland Economy Studios - Orlando - UCF Area in Orlando, you&apos;ll be in the suburbs and minutes from Congo River Golf - East Orlando, and close to Florida Technical College. 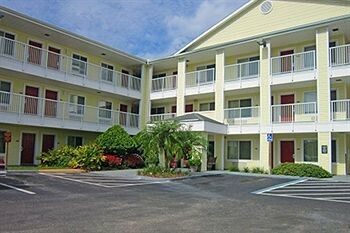 This hotel is within close proximity of Waterford Lakes Town Center and University of Central Florida Art Gallery.Rooms Make yourself at home in one of the 138 air-conditioned rooms featuring kitchens with refrigerators and stovetops. Complimentary wireless Internet access keeps you connected, and cable programming is available for your entertainment. Conveniences include desks and microwaves, as well as phones with free local calls.Rec, Spa, Premium Amenities Make use of convenient amenities, which include complimentary wireless Internet access and discounted use of a nearby fitness facility.Business, Other Amenities Featured amenities include a 24-hour front desk, laundry facilities, and a safe deposit box at the front desk.